Solar minimum is approaching and the solar activity has been very low for many months now. As a result, we are exposed again to more high-energetic particles coming from outside our solar system, the so-called cosmic rays. Note that the term "ray" is somewhat misleading, dating from the times when cosmic rays were thought to be some kind of electromagnetic radiation. When researchers talk about cosmic rays, they usually mean those particles coming from every direction outside our solar system. Those coming from our own galaxy or from other galaxies are also called galactic cosmic rays (GCR), to distinguish them from solar cosmic rays (SCR; occasionally produced during strong solar flares) and anomalous cosmic rays (ACR; produced near the solar wind termination shock within our heliosphere). See NASA's Cosmicopia for more details on the different types of cosmic rays. Interestingly, the potential sources of the cosmic rays are still somewhat of a mystery. Indeed, because cosmic rays are charged particles, their paths cannot be traced directly back to their sources due to the powerful magnetic fields that fill space and warp their trajectories. But the powerful cosmic accelerators that produce them will also produce neutrinos. Neutrinos are uncharged particles, unaffected by even the most powerful magnetic field. Because they rarely interact with matter and have almost no mass, neutrinos travel nearly undisturbed from their accelerators, giving scientists an almost direct pointer to their source. 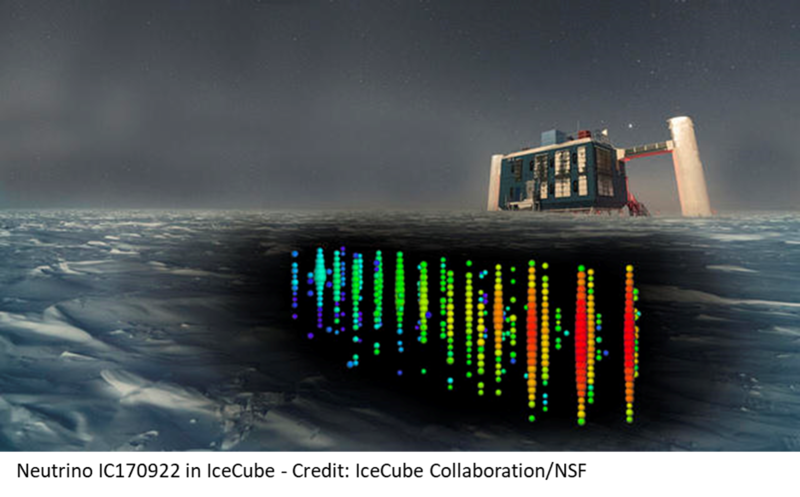 On 12 July, an international team of scientists led by the IceCube Neutrino Observatory (located in Antarctica - see image above) announced that they had just traced such a high-energy neutrino back to its point of origin 3.7 billion light-years away (note our Sun is just about 8 light-minutes away...). 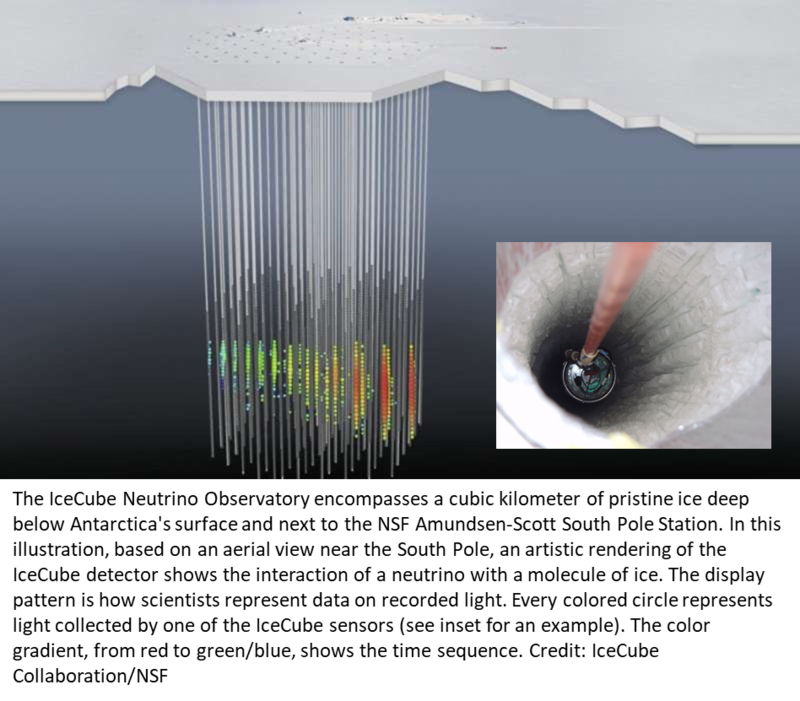 The neutrino hit the IceCube detectors, which are buried under 1.5 to 2.5 km of ice, on 22 September. Following the alert sent out by the IceCube team, a whole suite of satellites and other instruments were immediately directed to the possible location. The source of the neutrino was found to be a blazar, i.e. a giant elliptical galaxy with a massive, rapidly spinning black hole at its core. The press release by IceCube reveals all the details on how the discovery was made. So, now at least one source of cosmic rays has been identified! When entering the heliosphere, cosmic rays encounter a turbulent solar wind with an embedded heliospheric magnetic field. The higher the solar activity, the more intense and complex this magnetic field, and the more difficult it is for a particle to make it all the way to the Earth. When some finally arrive, they collide with particles in the Earth's atmosphere, creating a shower of secondary particles such as neutrons (an entirely different particle than a neutrino). These neutrons are detected by neutron monitors such as in Dourbes or various other sites around the world (Moscow, Oulu,...). The graph underneath shows the monthly and monthly smoothed neutron count by the neutron monitor from Moscow since 1958. 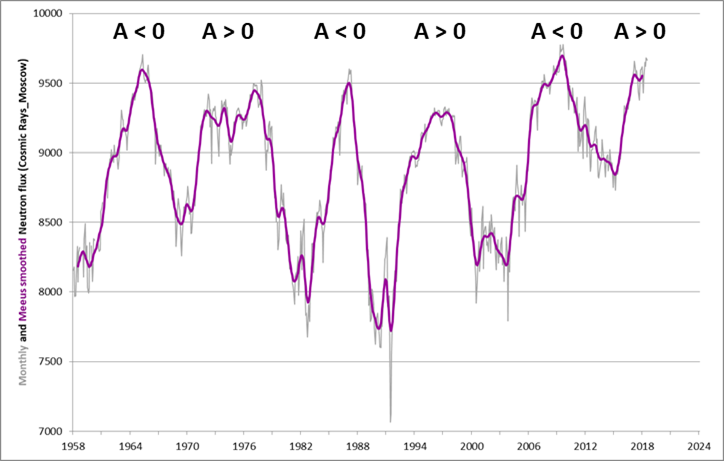 One can readily see the 11 year solar cycle modulation, with particle counts being the highest during low solar activity (solar cycle minimum) and vice versa. There's also a 22 year cycle, constituting of a "pointy" (A < 0) and a "flat" (A > 0) maximum in the neutron counts. This is because the cosmic rays are charged particles, and thus they react differently to the different magnetic configuration in the heliosphere created after each polar field reversal on the Sun. "A" represents the polarity of the solar magnetic field, which is taken as positive (A > 0) when the dominant polar field is outward in the northern and inward in the southern hemisphere, and it is taken as negative (A < 0) if the opposite is the case. One can also see that the current neutron counts are already similar to those recorded during the unusual deep and long solar cycle minimum in 2008-2009. Some of the dips in the monthly values are due to high solar activity: many coronal mass ejections act as magnetic shields against the cosmic rays, effectively reducing the final neutron count. The small dip at the most recent maximum corresponds to the high solar activity in September 2017. Studies of cosmic rays are very important, as these massive high-energetic particles pose a formidable radiation hazard to astronauts on a future mission to e.g. Mars or the Moon. 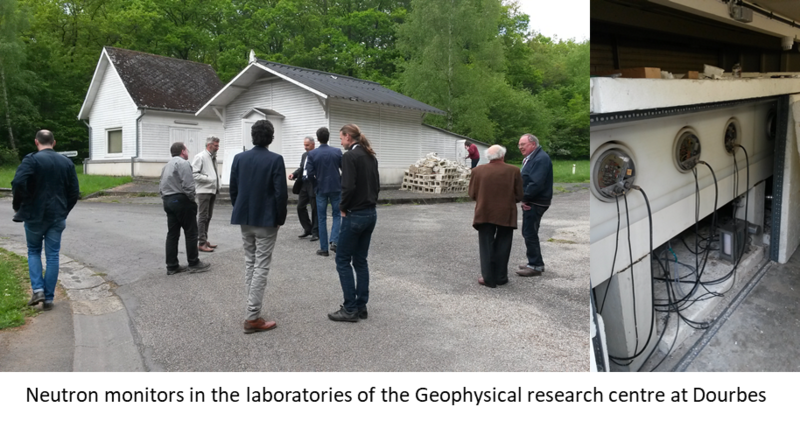 - The IceCube press release on the discovery, with more info on the IceCube neutrino observatory.